Ham soups are an easy and clever way to stretch your family food budget, get extra protein into kids, and use up Christmas or Easter leftovers and other ingredients from your fridge or pantry. These warm and comforting recipes can be made any time you crave a stomach-warming bowlful of soup for lunch of dinner. They also make great school lunches and freeze well for make-ahead meals. Crockpot bean soup with ham is a great "set and forget" dinner that cooks while you go about your day. Just assemble ingredients in the morning and come home to a rib-sticking bowl filled with two kinds of beans, tomatoes, carrots, corn, and great smoky flavor. Budget-friendly lentil soup gets even better with carrots, celery, onions, and diced cooked ham. It's simmered slowly on the stove top with an added ham hock for a satisfying family meal that's full of protein. Serve with biscuits, rolls, or cornbread, and a green salad as a complete family dinner. This aromatic Southwestern black bean soup is flavored with lots of pantry spices, a savory ham bone, and vegetables. It begins with dried black beans, which cook slowly with other ingredients, including optional sherry or white wine to taste. Top with diced scallions and sour cream and serve with tortilla chips or pita bread triangles on the side for dipping. Split pea soup cooked with a ham bone is a comfort-food favorite and makes a great thermos lunch on cold or rainy days. It cooks in a few hours on your stove with soaked dried split peas, ham, onion, carrots, and a whole lot of dried herbs and spices. Top with some extra diced cooked ham and shredded cheddar cheese for serving. Want a new way to use up those green and red tomatoes in your garden? Turn them into a healthy lunch or dinner soup with this recipe. It includes dry aged country ham, plus jalapeno and optional Tabasco sauce for a punch of heat. This chunky potato soup with ham puts an American twist on the classic French vichyssoise. Loads of diced ham goes into the rich and robust bowl, along with potatoes, carrots, onion, heavy cream, and vegetable broth. A potluck favorite, this black bean soup is easy to prepare when using a slow cooker. Be sure to make time for soaking dried beans overnight before adding to your crockpot in the morning with other ingredients. Serve it hot, garnished with cilantro and sour cream or cheddar cheese shreds. 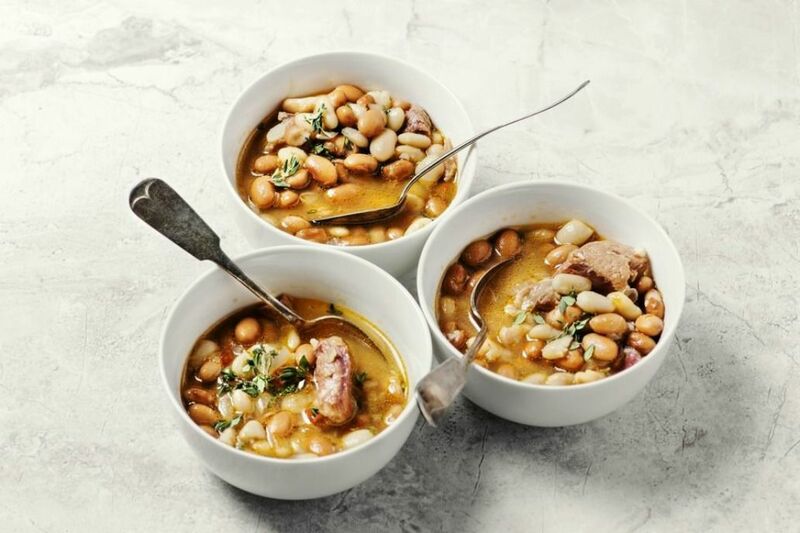 Salty ham bone adds satisfying, savory depth to this protein-rich white bean soup. With plenty of nutritious veggies—including fennel, onion, carrot, celery, corn, spinach, and tomatoes—it makes a stomach-warming lunch or dinner. When you don't have time to make traditional split pea soup, this recipe offers a fabulous shortcut. Frozen green peas combine with diced cooked ham, chicken or beef stock, and a few other simple ingredients to form a filling version that's ready in 30 minutes. Creamy country ham soup with potatoes and spinach is just calling for crusty bread slices. Fennel adds nice aroma and flavor to this filling soup, which uses chicken broth (feel free to buy it prepared) as a base. Enjoy the classic American soup served on Capitol Hill from the comfort of home. Dried navy beans are first soaked, then cooked on the stove until tender. Potatoes, onion, garlic, celery, and a meaty ham bone (or smoked ham hocks) add heft and flavor. Corn chowder tastes even better when you add salty diced cooked ham. Two different kinds of condensed soup go into this homey recipe, along with a good amount of cream, giving it an extra rich and velvety texture. 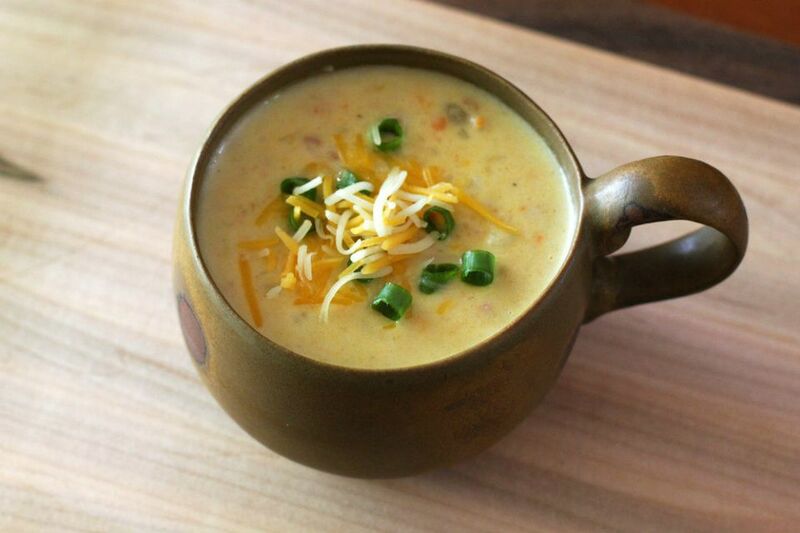 Stovetop potato soup with diced ham and cheddar cheese is simple to prepare and easy on your grocery budget. It's also a great way to use up leftover cooked ham from holiday meals. Serve it with crusty rolls or bread and a tossed green salad for a filling lunch or dinner. This worry-free lentil soup with ham cooks all day in your crockpot. Feel free to add any extra vegetables you have in the fridge, or boost the spice level with some cumin, curry powder, or cayenne pepper.